Calcium/calmodulin-dependent protein kinase type II gamma chain is an enzyme that in humans is encoded by the CAMK2G gene. The product of this gene belongs to the Serine/Threonine protein kinase family, and to the Ca(2+)/calmodulin-dependent protein kinase subfamily. Calcium signaling is crucial for several aspects of plasticity at glutamatergic synapses. 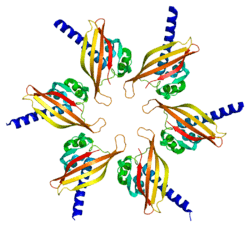 In mammalian cells the enzyme is composed of four different chains: alpha, beta, gamma, and delta. The product of this gene is a gamma chain. Six alternatively spliced variants that encode six different isoforms have been characterized to date. Additional alternative splice variants that encode different isoforms have been described, but their full-length nature has not been determined. CAMK2G has been shown to interact with RRAD. ↑ "Drugs that physically interact with Calcium/calmodulin-dependent protein kinase type II subunit gamma view/edit references on wikidata". ↑ Li X, Nghiem P, Schulman H, Francke U (Feb 1994). "Localization of the CAMKG gene encoding gamma isoforms of multifunctional calcium/calmodulin-dependent protein kinase (CaM kinase) to human chromosome 10 band q22 and mouse chromosome 14". Cytogenet Cell Genet. 66 (2): 113–6. doi:10.1159/000133679. PMID 8287681. ↑ "Entrez Gene: CAMK2G calcium/calmodulin-dependent protein kinase (CaM kinase) II gamma". ↑ Moyers JS, Bilan PJ, Zhu J, Kahn CR (May 1997). "Rad and Rad-related GTPases interact with calmodulin and calmodulin-dependent protein kinase II". J. Biol. Chem. 272 (18): 11832–9. doi:10.1074/jbc.272.18.11832. PMID 9115241. Hook SS, Means AR (2001). "Ca(2+)/CaM-dependent kinases: from activation to function.". Annu. Rev. Pharmacol. Toxicol. 41: 471–505. doi:10.1146/annurev.pharmtox.41.1.471. PMID 11264466. Yamamoto H (2002). "[Molecular mechanisms of the intracellular localizations of Ca2+/calmodulin-dependent protein kinase II isoforms, and their physiological functions]". Tanpakushitsu Kakusan Koso. 47 (3): 241–7. PMID 11889801. Ikebe M, Reardon S (1990). "Phosphorylation of smooth myosin light chain kinase by smooth muscle Ca2+/calmodulin-dependent multifunctional protein kinase.". J. Biol. Chem. 265 (16): 8975–8. PMID 2160950. Czernik AJ, Pang DT, Greengard P (1987). "Amino acid sequences surrounding the cAMP-dependent and calcium/calmodulin-dependent phosphorylation sites in rat and bovine synapsin I.". Proc. Natl. Acad. Sci. U.S.A. 84 (21): 7518–22. doi:10.1073/pnas.84.21.7518. PMC 299327 . PMID 3118371. Vulliet PR, Woodgett JR, Cohen P (1984). "Phosphorylation of tyrosine hydroxylase by calmodulin-dependent multiprotein kinase.". J. Biol. Chem. 259 (22): 13680–3. PMID 6150037. Wen Z, Zhong Z, Darnell JE (1995). "Maximal activation of transcription by Stat1 and Stat3 requires both tyrosine and serine phosphorylation.". Cell. 82 (2): 241–50. doi:10.1016/0092-8674(95)90311-9. PMID 7543024. Kwiatkowski AP, McGill JM (1995). "Human biliary epithelial cell line Mz-ChA-1 expresses new isoforms of calmodulin-dependent protein kinase II.". Gastroenterology. 109 (4): 1316–23. doi:10.1016/0016-5085(95)90594-4. PMID 7557101. Shuai K, Stark GR, Kerr IM, Darnell JE (1993). "A single phosphotyrosine residue of Stat91 required for gene activation by interferon-gamma.". Science. 261 (5129): 1744–6. doi:10.1126/science.7690989. PMID 7690989. Zhu J, Reynet C, Caldwell JS, Kahn CR (1995). "Characterization of Rad, a new member of Ras/GTPase superfamily, and its regulation by a unique GTPase-activating protein (GAP)-like activity.". J. Biol. Chem. 270 (9): 4805–12. doi:10.1074/jbc.270.9.4805. PMID 7876254. Suko J, Maurer-Fogy I, Plank B, Bertel O, Wyskovsky W, Hohenegger M, Hellmann G (1993). "Phosphorylation of serine 2843 in ryanodine receptor-calcium release channel of skeletal muscle by cAMP-, cGMP- and CaM-dependent protein kinase". Biochim. Biophys. Acta. 1175 (2): 193–206. doi:10.1016/0167-4889(93)90023-I. PMID 8380342.
de Groot RP, den Hertog J, Vandenheede JR, Goris J, Sassone-Corsi P (1993). "Multiple and cooperative phosphorylation events regulate the CREM activator function". EMBO J. 12 (10): 3903–11. PMC 413673 . PMID 8404858. Nghiem P, Saati SM, Martens CL, Gardner P, Schulman H (1993). "Cloning and analysis of two new isoforms of multifunctional Ca2+/calmodulin-dependent protein kinase. Expression in multiple human tissues". J. Biol. Chem. 268 (8): 5471–9. PMID 8449910. Shimomura A, Ogawa Y, Kitani T, Fujisawa H, Hagiwara M (1996). "Calmodulin-dependent protein kinase II potentiates transcriptional activation through activating transcription factor 1 but not cAMP response element-binding protein". J. Biol. Chem. 271 (30): 17957–60. doi:10.1074/jbc.271.30.17957. PMID 8663317. Wei J, Wayman G, Storm DR (1996). "Phosphorylation and inhibition of type III adenylyl cyclase by calmodulin-dependent protein kinase II in vivo". J. Biol. Chem. 271 (39): 24231–5. doi:10.1074/jbc.271.39.24231. PMID 8798667. Tombes RM, Krystal GW (1997). "Identification of novel human tumor cell-specific CaMK-II variants". Biochim. Biophys. Acta. 1355 (3): 281–92. doi:10.1016/S0167-4889(96)00141-3. PMID 9060999. Moyers JS, Bilan PJ, Zhu J, Kahn CR (1997). "Rad and Rad-related GTPases interact with calmodulin and calmodulin-dependent protein kinase II". J. Biol. Chem. 272 (18): 11832–9. doi:10.1074/jbc.272.18.11832. PMID 9115241.